Cats thrive on a grain free diet high in quality protein with moderate fat levels and low levels of carbohydrates. 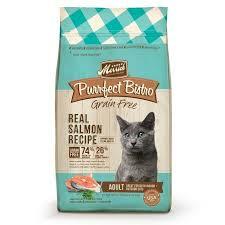 That’s why Purrfect Bistro Grain Free Real Salmon Recipe Cat Food provides balanced nutrition using real whole foods. This natural, 100% grain free formula cat food is ideal for adult cats 1 – 7 years old with a focus on nutrient rich ingredients to support overall health.